at 114 Eden on the Bay, a delightful 2-bedroom apartment situated close to the famous beach of Big Bay, accommodating 4 guests. The air-conditioned main interior, done in pristine white as well as neutral shades and elegantly decorated, is open plan with the kitchen leading to the dining area and lounge. 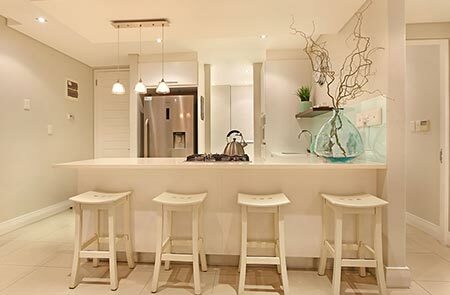 The stylish kitchen has all the necessary features for a pleasurable self-catering stay. The spacious dining area seats 8 around a long, polished table and the lounge, with ample and luxurious seating features a flat-screen TV and offers a gorgeous view of the Atlantic Ocean. The lounge and dining area furthermore lead out to a balcony, well furnished with lounge and dining furniture and including a barbecue facility, ensuring a relaxing time outdoors. 114 Eden on the Bay comes with two bathrooms. 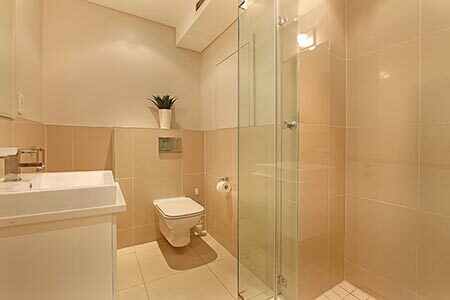 One is en-suite with a bath, shower as well as his and hers hand basins. The other comprises of a shower and hand basin. 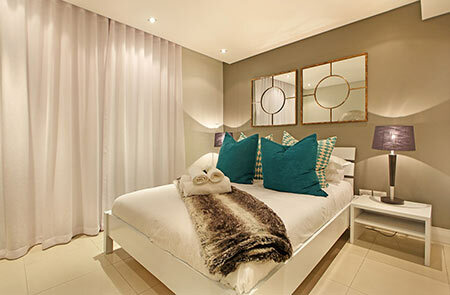 Book this appealing accommodation offer that is 114 Eden on the Bay and experience the serene area of Big Bay in Bloubergstrand as well as breathtaking sunsets over the Atlantic Ocean.